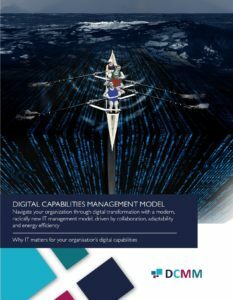 This is an introduction course to entirely new (2019) digital capabilities management model, targeted to collaborative management of internal IT departments, supporting organization’s wide digital transformation efforts. Price: 580 EUR 485 GBP 696 USD VAT excl. Dates and places: View the course calendar on our web page. Target group: Any IT professional aiming to learn about radically new management model supporting digital transformation. Course details for download in PDF are here. Course learning objectives: Learn participant new management model discontinuing service management logic. Course participants will understand key differences between service economy logic and collaborative model, where driving motivation is minimized administrative overhead, flexibility, sharing of resources and maximized benefit measured on the organization level.